If you had asked me a couple years ago, I would have told you that I only drink coffee a couple times a week. These days, it’s nearly an every day sort of thing. I refuse to call it an addiction because I can, if I’m forced to by a mile-long line that I refuse to wait in, go without my morning cup and still feel ok. But when it comes to coffee in my cake, there’s no way I can pass it up. And when that cake is made by hand, and without a bowl – yes, without a bowl – get the hell out of my way. I about died (a forehead slap definitely happened) when I saw this no-bowl cake technique pop up on The Cake Essentials DVD I watched over the weekend. My friends at King Arthur Flour were kind enough to send me a copy of this DVD along with a few other goodies (see the giveaway details below) and asked me to make a cake inspired by the DVD. And this double mocha snack cake (mocha cake and frosting), made using a stir-together technique directly in the cake pan, happened almost faster than it takes to get a non-fat vanilla latte. If a from-scratch cake can be popped in the oven in under 7 minutes without any bowls or beaters to clean up, I am all in. It was a little tough to get out of the pan and I probably should have sprayed the pan first, but other than that, we’re talking an awesome snack cake here, people. The cake doesn’t actually need frosting – powdered sugar dusted on top would have been lovely – but really, it’s cake. I would risk sleeping in another room if I served Kyle cake without frosting. (I’m kidding…sort of.) The mocha frosting is worthy of its own post and perhaps it will land there in the future but I had to share it with you today. You need it today. The frosting is a-freaking-mazing. Light, fluffy, rich, coffee-e. Perfect. So aside from this cake, there’s The Cake Essentials DVD…and I think it will surprise you. Yes, even you experienced bakers out there! Susan Reid, the editor of KAF’s The Baking Sheet puts every ounce of her cake-baking knowledge and love into showing you how to make a huge variety of cakes (butter cakes, cheesecakes, stir-togethers, and sponge cakes), goes over more techniques for making a cake than I even knew existed, and quite literally shows you how to avoid cake disasters. I was privileged to have had Susan teach the flour essentials class when I was at Blog & Bake last June so I can honestly say that this woman knows her stuff and it was a pleasure watching in action again. As far as the giveaway goes…King Arthur Flour has offered up a jammed-packed gift package to one lucky reader so that one of you will have no more excuses for not making a great cake. Answer me this in the comment section of this post (and only this post): What is your favorite type of cake? Only one entry per person will be accepted and you MUST include a valid email address in the comment form. If you don’t see your comment post right away, please don’t post another comment. The delay happens because I moderate all comments. Giveaway closes on Monday, April 1, 2013 at 11:59pm Eastern. One winner will be chosen by that handy-dandy random number generator we’re all familiar with. The winner will notified by Tuesday morning. If the winner does not respond to my email within 48 hours, another winner will be chosen (also at random). Giveaway is open to entries with U.S. addresses only. Yield: 12 servings of cake and plenty of frosting for the top of the cake (plus a little extra). Double these recipes for a 8- or 9-inch layer cake or 24 cupcakes. To make the cake: Preheat oven to 350° F. Lightly spray an 8-inch square or round cake pan with cooking spray. 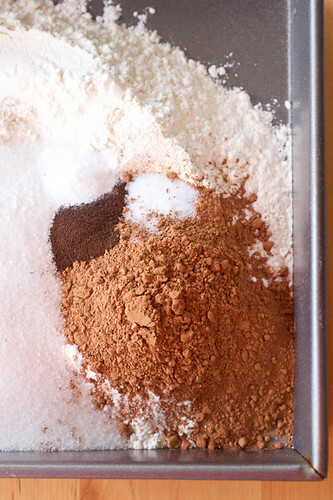 Measure the flour, sugar, cocoa powder, salt, espresso powder, and baking soda directly into the pan. Stir all of the ingredients together until they are well-combined. Make three little wells in the dry mixture and pour the vanilla, vinegar, and oil each into a separate well. Pour the hot coffee over all of the ingredients and stir lightly with a fork until a batter forms and there are no streaks of dry ingredients remaining – be sure to check the corners well. Bake for 25-35 minutes, until a toothpick poked into the center of the cake comes out clean. (My dark pan baked this cake in 26 minutes.) Cool on a wire rack for 15 minutes. Serve the cake either right from the pan (either warm by itself or completely cooled with the frosting below) or gently coax it out onto a cake plate. To make the frosting: While the cake bakes, make the frosting. Beat the butter and salt in a stand mixer or with a hand mixer in a large bowl until light and fluffy, about 2 minutes. Gradually beat in the confectioners’ sugar, cocoa powder, and espresso powder. Once incorporated, beat on medium for 1 minute. With the mixer on low, pour the vanilla and heavy cream into the bowl and mix it into the frosting. Increase the speed to medium and beat the frosting for 30 seconds. Disclaimer: This giveaway is sponsored by King Arthur Flour. I was provided with the same package that is being given away here. I was not compensated for writing this post and all of the opinions are of course, my own. 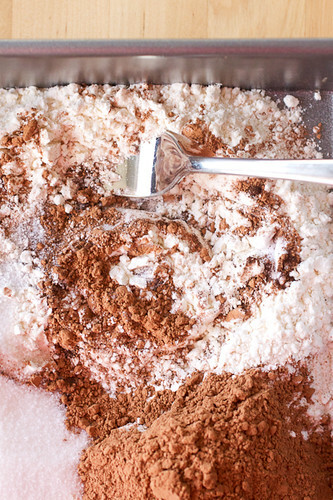 Measure the flour, sugar, cocoa powder, salt, espresso powder, and baking soda directly into the pan. Stir all of the ingredients together until they are well-combined. Make three little wells in the dry mixture and pour the vanilla, vinegar, and oil each into a separate well. Pour the hot coffee over all of the ingredients and stir lightly with a fork until a batter forms and there are no streaks of dry ingredients remaining – be sure to check the corners well. Bake for 25-35 minutes, until a toothpick poked into the center of the cake comes out clean. (My dark pan baked this cake in 26 minutes.) Cool on a wire rack for 15 minutes. Serve the cake either right from the pan (either warm by itself or completely cooled with the frosting below) or gently coax it out onto a cake plate. To make the frosting: While the cake bakes, make the frosting. Beat the butter and salt in a stand mixer or with a hand mixer in a large bowl until light and fluffy, about 2 minutes. Gradually beat in the confectioners’ sugar, cocoa powder, and espresso powder. Once incorporated, beat on medium for 1 minute. With the mixer on low, pour the vanilla and heavy cream into the bowl and mix it into the frosting. Increase the speed to medium and beat the frosting for 30 seconds. Frost cake as desired. I love the presentation of layer cakes… chocolate raspberry might be my favorite! I wish I could be more interesting, but my favorite cake has to be a chocolate cake with chocolate frosting. Rich, fudgy, chocolatey–what more could you want? I love all cake, but I think my favorite is vanilla cake with chocolate frosting. Some sort of fruity filling will put it over the top for me. I love a dark chocolate cake with salted caramel buttercream frosting. My mouth is watering just thinking about it! Definitely yellow butter cake with chocolate frosting! I’ve always been partial to red velvet cake with a layer of cheesecake in between with lots of cream cheese frosting. I really like a simple moist chocolate cake with vanilla butter cream. My favorite cake is red velvet with cream cheese frosting. Chocolate cake with peanut butter buttercream is my favorite! My favorite cake is Texas Sheet cake! I have always been partial to yellow cake with chocolate frosting. Always my birthday request when growing up! Carrot Cake! It will grace our Easter table on Sunday. I’m easy–my favorite type of cake is anything with frosting! Most definitely carrot cake with cream cheese frosting. Have a happy day! I cannot resist a good old-fashioned red velvet cake with traditional white/vanilla frosting, just like my grandmother used to make! Oooh I mean my favorite cake would have to be an extra fudgy extra chocolatey chocolate cake! My favorite type of cake is chocolate! with a whipped cream frosting! Carrot cake, with raisins in the mix, with homemade cream cheese frosting. Banana Cake with Strawberry butter cream cheese frosting, Oh, my! My favorite cake is coconut cake! Would NEVER pass up a piece. Heck, most cakes I like as long as they are banana free. My favorite cake is carrot cake with cream cheese frosting. I like my carrot cake to have lots of carrot-ty flavor, nuts, raisins, pineapple, and coconut in it. The frosting should be slightly sweet; just enough to bring out the spices in the cake…yum! Triple chocolate cake! Or anything chocolate for that matter. I guess some people could consider me boring, but I really prefer a white cake with white (vanilla) frosting. Some sprinkles on top are always a welcome bonus. i love red velvet cake! so good!! I am a from scratch fresh strawberry cake lover with cream cheese frosting and fresh strawberries on top…YUM!! I’m a chocolate girl – rich and fudgy chocolate cake with a nice, smooth chocolate frosting. Wow the double mocha looks amazing! My favorite is chocolate cake with chocolate frosting. Dark chocolate fudge cake with ganache! This cake might be my new favorite though! 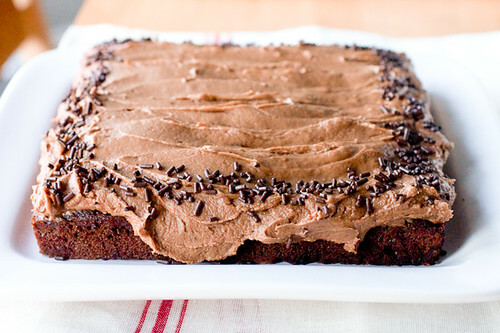 i love banana chocolate chip cake with chocolate frosting!! I love A chiffon cake. It is so light and you can be creative. with flavors and frostings. German chocolate cake. I haven’t had it in a very long time, but it has always been my favorite. My current favorite cake is the 4 layer carrot cake, recipe from COOK’S ILLUSTRATED, made with currants instead of raisin, a sheet cake to build the 4 layers, WONDERFUL! My favorite cake? Probably a gingerbread cake with cream cheese frosting. I like tose Italian cakes with fruit layers. German Chocolate Cake with Coconut Pecan Frosting is my favorite layer cake! I will be 60 next month and that has been my birthday cake for as many years as I can remember! If I had to choose…yellow cake with chocolate frosting. But seriously, any variety – frosted or not – I can’t resist. A simple, fresh lemon bundt cake with a lemony glaze. If you’d asked in the winter months I might have gone with a variety of chocolate, but spring is here and it’s all about fresh fruit flavors! I can’t pick a favorite, I love them all! But I think the best cake I made at home was a pink lemonade cake for Mother’s Day last year – it was deeeeelicious!! What a fun givewaway, love KAF! I guess I’ll say chocolate is my favorite cake, though carrot cake is up there too. I love carrot cake. We even had it as our wedding cake! Thanks for the opportunity! my fav type of cake is Coconut cake!!! I love dark chocolate cake with lots of vanilla buttercream! I love almost all cakes. But I especially love cheesecake and dense, fudgey chocolate ones! I love poundcake because it is so wonderful just plain or can be dressed up so many ways by adding flavorings or toppings! Looks so good! My fave cake is anything chocolate – yum! Homemade yellow cake with cooked caramel frosting. I love vanilla cake with chocolate frosting but really I’m a cake lover who will eat just about any cake out there. This looks divine. My favorite cake is a Devil’s Food Chocolate Cake with Chocolate Buttercream Frosting! Yummy! Fudge marble cake is my favorite cake! Chocolate, yo. This cake looks great – thanks for hosting such an awesome giveaway! Oh dear, it is hard to pick just one favorite. One of the local restaurants has a really delicious carrot cake that I’ve been craving, so I’ll go with that. I love chocolate layer cakes! Carrot cake is my favorite. My favorite cake is coconut layer cake with a lemon curd filling. My favorite will always be chocolate cake with a vanilla butter cream thanks to my mom who always made it on my birthday growing up. After all these years, I still love my Mom’s chocolate cake with vanilla frosting the most! Chocolate is the one I make most. Although I’ve fallen in love with the Rum Cake recently. Yellow cake with chocolate frosting!! I LOVE a chocolate buttermilk cake (with coffee in the recipe even though you can’t taste it) topped with chocolate ganache and perhaps a dollop of whipped cream! Or my friends made up on the fly nutella cake that was ridiculously awesome. This looks delicious and pretty easy! My favorite cake is a Hershey Cocoa Cake with Vanilla Butter cream frosting. So yum! I’ll be having some for my birthday soon — 30 in 32 days! It’s gotta be chocolate peanut butter ! Anything with cream cheese frosting! But, if I had to choose one, carrot cake is my favorite! My favorite cake has always been a simple vanilla cake with traditional buttercream–wish I had a slice now! My favorite cake is what we call Poor Man’s Cake. My grandmother clipped it out of the newspaper during the Depression. It’s a recipe with no egg…since they were rationed at that time. My grandma always made it and frosted it with a powdered sugar frosting that she dyed pink with cherry juice. I still make it today and it always reminds me of my Gram! I just love German chocolate cake with the yummy nuts and coconut frosting. I LOVE Italian Cream Cake – and seem to only get to eat it once a year. Moving out of the South is the pits. Chocolate Lava Cake can’t be beat! My favorite type of cake is strawberry with cream cheese frosting with strawberries on top and in the batter! Thank you for the wonderful giveaway! I think my favorite cake is chocolate, filled with raspberries, and chocolate whip cream frosting. Coconut cake with White Mountain Frosting is my favorite, but I also love banana nut cake with banana buttercream frosting. I love, love, love a lemony lemon cake, but chocolate is also a favorite. Such a great idea to have no bowl clean up for cake. I love all cake (especially the icing) but my favorite is my mom’s chocolate sheet cake. I love just about any type of cake, but my favorite is vanilla with fluffy white icing. My favorite cake is a moist multi-layer chocolate cake w/ peanut butter frosting! But I’d really like to learn how to make a good cheesecake. I’ve never made one before. I’m a vanilla cake girl…it’s the perfect compliment to every frosting! My favorite kind of cake is chocolate cake with chocolate-orange frosting! MMM! A simple French-style yogurt cake (gateau au yaourt)–you can tailor it to whatever you’re craving (rhum, apples, chocolate)–the possibilities are endless and one almost always has the ingredients on hand for this one bowl cake. My favorite cake has to be red velvet. My all time favorite cake is Carrot Cake. Always has been and always will be! Gosh, I love KAF…always drool over all the fun stuff in their catalog! My favorite cake is definitely devil’s food with swiss meringue buttercream! My favorite cake is a dark chocolate cake with chocolate Icing. My husband’s favorite cake is Boston Cream Pie. I have never been much of a cake girl, but if I have to choose, it’d be carrot cake. Sticky toffee pudding cake is the best cake out there!!! why such a hard question? My answer would be ANY cake that complements ice cream! If I have to choose…upside down German chocolate cake – all the awesomeness and far easier to bake! My favorite kind of cake isn’t actually a certain flavor but simply wedding cake. Attending weddings isn’t my favorite thing to do but the cake makes it very tolerable. They are usually very beautiful and quite tasty, most of the time they are top notch! So many great cakes and cake/frosting combos…but I think I’d have to go with yellow cake, white frosting, vanilla pastry cream between the layers! I love banana cake with cream cheese frosting! I love anything chocolate, the fudgier the better… if something raspberry is in there too, I’m in heaven. I don’t think that I’ve had a cake that I didn’t like, but I guess my favorite would be chocolate layer cake with chocolate ganache filling and chocolate buttercream frosting. Dark chocolate cake with mocha cream cheese frosting ties with Black Forest for our family’s favorite cake. Triple Chocolate Mousse cake. KAF is great. I love their cookie companion cookbook. Carrot cake is my fave, I’d say, but chocolate cake ranks right up there, too! Love an angel food cake with fresh fruit topping. My favorite cake is yellow butter cake with a rich, creamy chocolate frosting! I love anything chocolate and/or cinnimon. Favorite Cake is Blackout Cake, a chocolate cake with mousse like filling covered with chocolate cake crumbs. My go to cake is a pound cake recipe handed down from my mother. I make it in a deep circular pan with a hole in the center (not exactly a bundt pan, this has straight sides and I’ve always known it as a the pound cake pan). The secret to this cake is the special unusual spice I use to flavor (you’ll have to pay me to find out), plus it can be made extra special by filling the hole with fruit, a very nice presentation. I love an old fashioned chocolate layer cake heavy on the chocolate frosting! I love any cake with cream cheese frosting! But my request when someone wants to make a cake for me would have to be fresh strawberry cake with–you guessed it–strawberry cream cheese frosting! I love an old fashioned chocolate layer cake heavy on the chocolate frosting. Yum! My favorite cake is definitely Boston Cream… vanilla layer cake with vanilla pastry cream and chocolate frosting… YUM! Anything chocolate gets my vote. If it also has coconut, so much the better! My favorite cake is chocolate with chocolate frosting. Carrot cake is definitely #2 on my list, though! Thanks for the recipe and the giveaway! My favorite cake is my mom’s Italian strawberry cake with whipped cream and zabaglione. Devils Food Cake with, of course, rich chocolate frosting! My favorite type of cake is a Red Velvet Cake. My Mom would make it for every special occasion, every birthday, graduation, in a book shaped (Wilton?) pan. It required a double recipe of batter to fill. I have spent years trying to recreate it! I love a moist apple bundt cake. Good for dessert and breakfast! That is such a tough question, I am really a sweets lover! I love Texas sheet cake but I think my all-time favorite, the one I always look for, is a yummy coconut cake! White or yellow cake, I don’t care, just love coconut desserts! Chocolate cake with LOTS of frosting is my favorite. 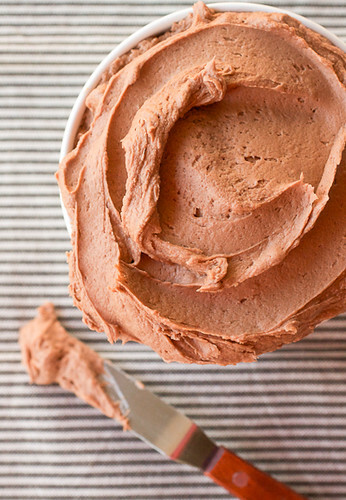 The mocha cake & frosting sound delicious! It’s hard to pick just one, but for this time of year,carrot cake for sure! I the winter I’d say red velvet though! My favorite kind of cake is anything that is deeply chocolate with a mocha frosting — so you can see why I ended up here! Chocolate cake with 7 minute frosting…Oh so many birthdays!! Not the fanciest thing I make, but I love a simple bundt cake with a simple glaze. Your cake looks wonderful — I’ll have to try it! I love all cake (and have the figure to prove it), but I would have to say yellow cake with chocolate frosting is my favorite. My favorite cake is Carrot Cake with Cream Cheese Frosting! I’ve always loved angel food cake since I was a very little girl. I love chocolate cake with peanut butter icing (also love coconut cake!). I love a good coconut cake with buttercream icing! Ice cream cake: chocolate cake with mint chip ice cream. Yellow cake with vanilla frosting – extra sprinkles! I love a dark chocolate sheet cake with a crackly glaze. And an old fashioned southern caramel cake, ahem. So many cakes, so little time! Thank you!! Well, I love a good wacky cake like the one you’ve posted, but my favorite would have to be apple cake. I love Chiffon cake, it is light and fluffy! My absolute favorite cake would have to be plain old chocolate. I adore the simple chocolate flavor! I love cheesecake, though it’s not exactly a cake. My favorite cake is chocolate with chocolate frosting. It can’t be beat! My favorite cake is chocolate with chocolate frosting. I like variations on this theme & coffee so I’m excited to try this mocha cake. So very eighties, but I can’t help loving the molten chocolate cake–it claims to be fancy, but it’s really just a more grown-up way to eat the batter! 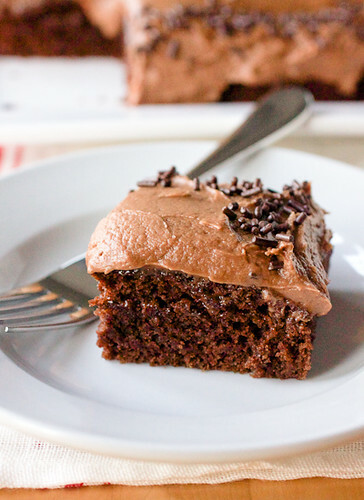 I just so loved your No bowl double Mocha cake and am bookmarking to make it very soon. My Favorite cake HAS to be a dark rich decadent chocolate cake!! My favorite cake is strawberry shortcake. I grew up with a chocolate cake with chocolate fudge frosting. Also have the recipe from my great grandmother for a yellow cake, but have to have the same frosting. Chocolate cake with salted caramel buttercream is my newest favorite! The Reese’s peanut butter cake you made for my birthday a few years ago. My favorite cake would be a moist yellow cake with chocolate frosting. A good chocolate cake is hard to beat! I love most flavors of cake, but I think my favorite would be classic chocolate cake with vanilla buttercream frosting! Tara, so glad I found this. I prefer cakes with fruit or fruit flavors, nuts or coconut. Spouse votes for chocolate. Personally, I love a good cream cheese pound cake or nut cake, tasty and moist enough that it doesn’t need frosting. Not that I don’t love frosting, however, a slice eaten out of hand has it’s charms. I occasionally make unique preserves & these are fun to work with. This came about when I first ran across a blackberry jam cake. There’s the Autumn Festival Cake made with both fig preserves in the cake and pear honey in the filling. Then there’s citrus & pears & apples. Oh, my! Sorry to have run off at the mouth. Did I say enough to churn your brain? I love Angel Food cake. I Die for Crumb Coffee Cake!